Supporting Image of representations of Marduk. Snake-Dragon at the Detroit Institute of Arts. 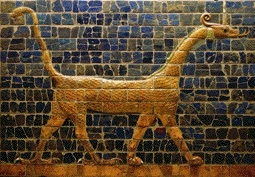 This is a glazed brick relief from the city of Babylon itself from the Neo Babylonian period. There are very few antropomorphic depictions of Marduk since he was usually represented as a man. The sculpture is about 115.6 x 167.0 cm, terracota and molded bricks in blue and yellow tones.